1979, graduate, Siberian Metal Institute; 1989, MSc in Metal Engineering; 1992, MSc in Economics, Russian Academy of National Economy; 1997, Doctorate in Metal Engineering; 1999, Professor, Russian Academy of National Economy; 2005, Doctorate in Economics. 1979, Shop-Master, Tulachermet Metal Works; 1986, Deputy Chief Engineer and 1989, Deputy General Director, Karaganda Iron and Steel Works; since 1998, current position. President: Russian Steel; Russian Shooting Union; Shooting Sports Federation of Russia. 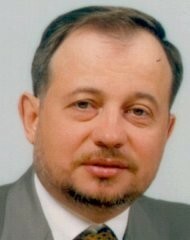 Board Bureau Member, Industrialists and Entrepreneurs Union of Russia. Author of over 100 works. Recipient of awards.